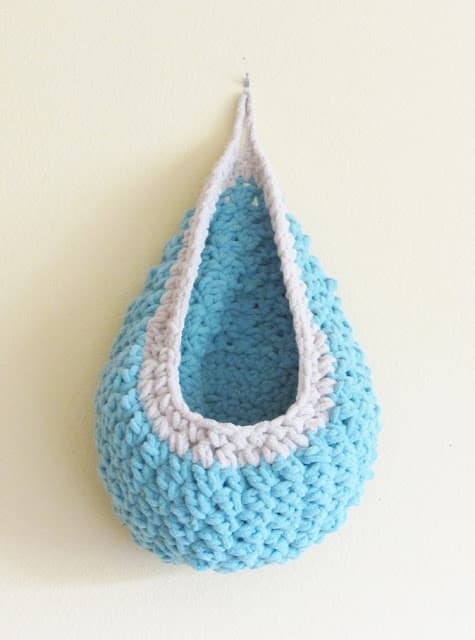 A crochet hanging basket can add to the charm of your studio or your kid’s nursery all while giving you a little extra storage space for your lightweight items. Use them to store towels, small stuffed toys or even hold plastic bags in your kitchen. 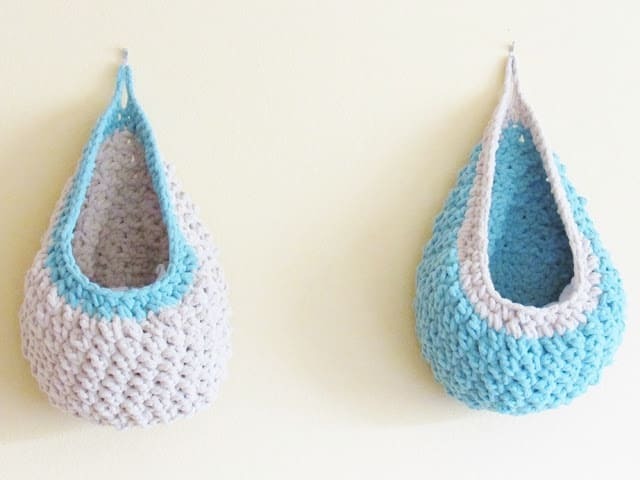 Since this crochet hanging basket pattern is designed using the plush and bulky Bernat blanket yarn all it takes is one strand to get a sturdy basket. No hassle of holding the strands together and hurting your hands. This is a very quick and easy pattern. When you get tired of working those Afghans this project could be the perfect break. 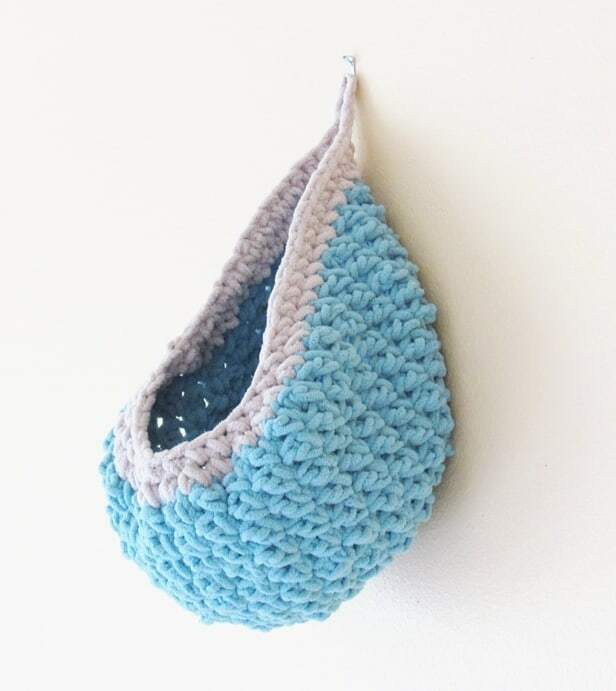 I hope you enjoy the free crochet pattern. 1. Super Bulky, size 6 yarn. Bernat Blanket yarn in the colors Light Teal and Almond were used for the samples. 2. An N/P (10)mm hook was used for the pattern. 4. A smaller hook for weaving in the tails. The pattern is in standard American terms. Ch 4, sl st to the first ch to form a ch ring. Round 8: 1 sc and 1 dc both into the marked st, move the marker up into the sc st, sk next st, *(1 sc and 1 dc in next st, sk next st), repeat from * until you skip the last st before the marked st.
Repeat the above round 8 more times. Your basket will be around 10 1/2 inches tall now. Next Round: Sl st to the marked sc while picking up the second color, 1 sc in next 6 sts, (2 sc in next, 1 sc in next)three times, 1 sc in next, (2 sc in next, 1 sc in next)twice, 2 sc in next st, 1 sc in next 6 sts, 16 sc2tog, sl st to 1st sc. Last Round: Ch 1( not counted as a st, 1 sc in next 15 sts, ch 5 for loop, 1 sc in next 15 sts, 1 sc in each st to end, sl st to 1st sc, fasten off and weave in the ends. 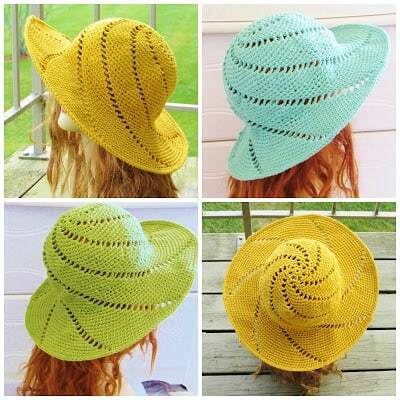 Check out my full collection of crochet patterns here: Pattern Gallery. See the two most famous spring patterns below. Could you tell me please, what are the dimensions of this basket? Thank you. When you hang it, it measures 13 inches long and around 10 inches wide. Could this pattern be made using 2 strands together of regular yarn instead of the bulky yarn to make the thickness? Considering how thick Bernat blanket yarn is, I think it would require 3 strands of worsted weight yarn. I would suggest you use 2 strands and check your gauge first and take it from there. Hello! 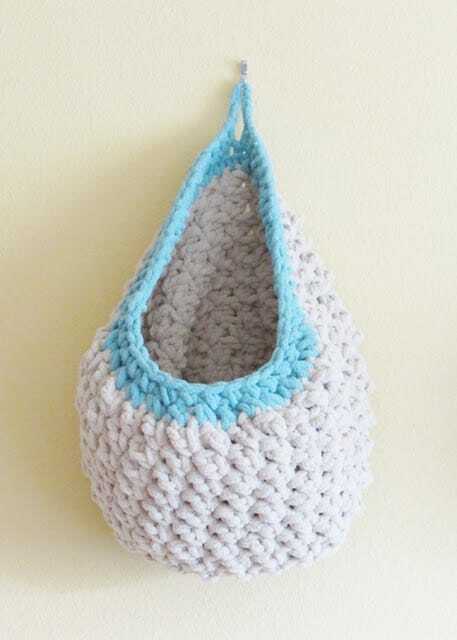 Would this be sturdy enough to use as a hanging cat bed, with a small pillow put inside it? Since it hangs from just one loop and I might be scared of the nail coming off, I wouldn't be comfortable using it for a cat. The only way you could use it is to hang it really low so that even if it falls the cat wouldn't be hurt. Hello! Your pattern is practical and beautiful! My two favorite attributes in any pattern. Thank you so much for publishing it free! Your pattern has inspired me to make a few changes for some specific purposes. Do you have any objection to me publishing those changes, with full credit and linked to this blog for the original pattern? I don’t want to do anything to make you upset as that would defeat the purpose of sharing! EM me, please, if you have a moment and let me know what you think. You are free to publish those changes as long as you are not republishing parts of my pattern and link to it as well. Thank you for asking. I made several and they a perfect in my craft room. I hung them on my peg board and they hold allot so everything is handy. Also it prettied up my room! That sounds wonderful! I am so glad you liked the pattern. Would you mind sharing a picture? I would love to share it on my social media.